Runs on 64 bit Windows 7/8/10 and 32 bit Windows XP, Vista, 7. USB PC based. PC mode: the programmer is controlled by a PC via a high-speed USB cable for chip programming. Stand-alone mode: the programmer is controlled and operated via a built-in keypad and LCD display. Project files are stored in a CF (compact flash) card for convenience and data security. Support files up to 256 GB. Vcc verification (at +5% ~ -5% and +10% ~ -10%) enhances programming reliability. 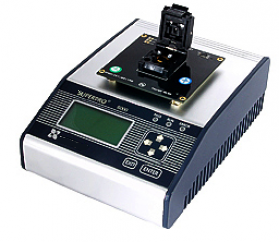 Ultra Fast Programming Speed SuperPro 6100 is designed with high programming speed in mind. Our semiconductor manufacturer approved algorithms, precision and clean signals guarantee high programming yield. Special design was made to eliminate overshoot and ground bounce. Algorithms are performed with state machine architecture constructed with FPGA to achieve a ultra-high programming speed. Largest Device Support Located in Silicon Valley, we keep good relationships with many major IC companies that are important for us to continuously support new devices. SuperPro 6100 currently supports more than 100,000 devices, which is the largest device library in the programming industry. Requested device algorithms can be added within a week - average lead time from other manufacturers is over two months. Project Files The project file stores preparations before programming. Users could also restore and save work environment. The project file includes device type, buffer data, operation option settings, configuration bit settings and batch commands. Project files may be password protected to increase security and reliability when operated by untrained operators. Auto Function The Auto function organizes different functions into a sequential group (erase, blank check, program, verify and protect). Functions are executed in sequential order similar to a batch command. Production Mode Once a chip is inserted correctly, the programmer automatically starts batch command of erase, blank check, program and verify. Auto chip detection saves time and increases efficiency. Production Statistics A log file could be used to save operation information before exiting the program. Log files can also be used to facilitate quality tracking. Factory Mode This mode is designed for factory volume production. To prevent operation errors from destroying chips and wrong data written to the chip, SuperPro will operate in the Auto function mode.The administrator can set a password to prevent unauthorized access to the system. Auto Recognition of File Types We support almost all kinds of known file formats including file formats with automatic recognition functions: Binary, Intel (linear & segmented) Hex, Motorola S, Tektronix (linear & segmented), JEDEC, POF, etc. Auto Increment of Serial Numbers Auto-generation of electronic serial numbers is available on Superpro 6100. This feature is implemented by setting Auto Increment in Operation Option. Auto Increment allows users to add unique serial number into the device. After each successful programming, the software automatically changes the value by the specified increment mode. Intellectual Property Protection Password settings available in both PC and stand-alone mode. 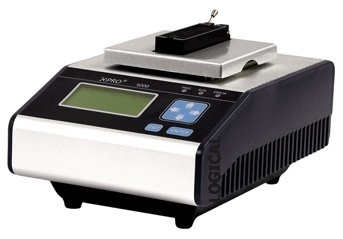 XPRO-6100 IS SOLD DIRECTLY BY LOGICAL DEVICES . FREE TRIAL AVAILABLE FOR ANY EXISTING LOGICAL OR NEEDHAMS CUSTOMERS.